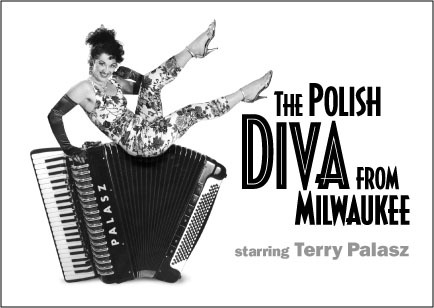 TERRY PALASZ is a singer actress noted especially for her comedic soprano roles in cabaret, musical theater and opera, most particularly, her one-woman musical comedy revue called THE POLISH DIVA FROM MILWAUKEE.She's performed the show all over the country, most recently for 8 weeks to sellout crowds at the Milwaukee Repertory Theater in the winter of 2006, and premiered the NYC version at Don't Tell Mama to critical acclaim. Among recent favorite performing experiences, she created the role of Lady Tremaine in the original musical TWICE CHARMED for Disney Creative Entertainment, and performed as a classical singer on a cruise ship with all Japanese passengers out of Malega, Spain. She was born and raised in Milwaukee, Wisconsin and received her Bachelor of Music in Vocal Performance from the Manhattan School of Music in NYC. Moving to Seattle in 1980, she started her performing career as an opera singer, making her opera debut as "Frasquita" in CARMEN at Seattle Opera in 1982 and singing roles such as "Perichole" in LA PERICHOLE and "Adele" in DIE FLEDERMAUS in companies around the Northwest. Desiring a more eclectic singing career, she moved into musical theater and cabaret, becoming known for her comic soprano roles in shows such as SINGIN IN THE RAIN (Dora Bailey), A LITTLE NIGHT MUSIC (Charlotte), and TINSELTOWN (Marlene Dietrich, Jeannette MacDonald). She created several roles for composer Scott Warrender (DAS BARBECU), including the Birdwoman in THE TEXAS CHAINSAW MANICURIST (Seattle Repertory Theatre) and April in THE BOOK OF JAMES. Since moving back to NYC eight years ago, Terry has performed in several musicals including the first regional production of TITANIC (Mrs. Widener), Yeston's PHANTOM (Carlotta), HOT 'N COLE and BEAUTY AND THE BEAST (Mrs. Potts). She's sung from the Red Rock mountains of Utah to the outskirts of the Mississippi River, and beyond. Her favorite eclectic experience was performing in 52 cities across the U.S.and Canada while travelling with 3 other people on a 60 foot bus! She's just produced her first CD, THE POLISH DIVA'S POLKA PARTY, which has already received airplay on polka radio stations across the United States.